The Bagalong with Crafternoon Treats group on Facebook is expanding rapidly now with almost 3,000 members as I write. Groups are great but collecting information on pattern links is tricky as the group app doesn’t have many features that are accessible on all devices. If you want to join the group please visit and request to join – approval is usually quick but bear in mind time zone differences. Us admins might be sleeping zzzzzzz. To find information about the bags we are doing, check the group files if you are on a desktop computer but don’t worry if you can’t find them on your phone. You can visit the events that are being set up for the group – these are dated January 2017, which doesn’t mean you have to wait until then to start. Its just so the event page doesn’t disappear. I’ll be extending the date when the time comes. The main info and pinned post contains info on all the links you need for each bag. My blog will also be hosting some Bagalong Quick Start Guides for each bag, which will be accessed via the Bagalong tab. This is the guide for the Bagalong bag of the month for October 2015 and its the Rainbow Tote Bag. As many of you will have seen, I made the rainbow tote bag using the Stylecraft Special DK Limited Edition colour pack for the blog tour last month. Here are the links for the rainbow tote bag and I’ve added plenty of pictures at the end so that you can see what the finished bag looks like. If you have any questions or need help, leave a message in the group! 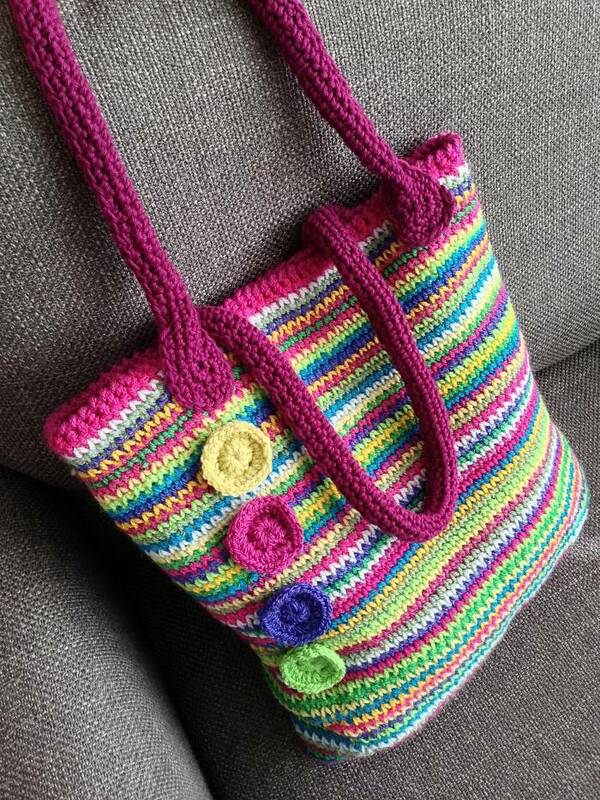 This entry was posted in Bagalong quick start guide, Crochet, Rainbow tote bag. Bookmark the permalink. Loved making the Rainbow Tote Bag. Looks great. Do you have any other patterns using the same Waistcoat Stitch? Gorgeous idea for Xmas gifts! !